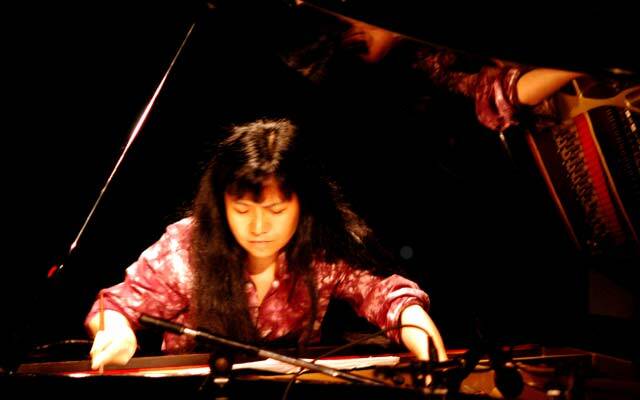 Satoko Fujii is not simply one of the most prolific performing and recording artists today, she is also bold enough to frogmarch music in any idiom ahead of anything else as she does for the piano what Anthony Braxton does for woodwinds. She is also a composer, and even greater performer, of great repute, just as Mr. Braxton is and like him also her music gleams with unsettling beauty. Her music always begins with paradoxes and beguiling paradigms, tracing her own aesthetic journey in microcosm. Soon, however, like peach blossoms, the flowers of spring, it blooms with astonishing macrocosmic majesty until, shaken by even gentle winds and it falls as it reaches its dénouement, or like Eric Dolphy once said, it vanishes into the air. And all you’re left with is powerful memories of what you have just heard: music that looks inward, but then seems to explode outward like a proverbial vortex. Despite what might seem like musical contradictions, her repertoire—whether solo, duo with husband and trumpeter, Natsuki Tamura, trio, quartet, quintet or large orchestra—shows the Japanese composer at her most eloquent and dramatic height. Musicians, once they understand where she is coming from come to take up her cause with consummate attention yo changing moods, interaction and breathtaking sweep. 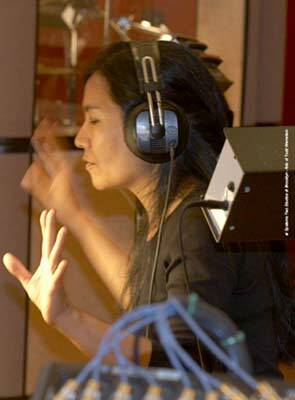 The spirit of Noh is never far away from Satoko Fujii’s art; the Japanese master’s voice is so ingrained in the sounds of her country that her music possesses an inimitable personality, It almost always emphasises the folk inspiration through flexible phrasing and subtle gradation of dynamics. On both discs, Ms. Fujii offers the listener performances that are analogous to “music’ but stripped away of the apparatus of music. A word of caution, here: Let it not be assumed that Satoko Fujii finds environmental sounds more attractive to the world’s musical cultures. This would be a gross misreading of Ms. Fujii’s mind and heart. Her dignity and intrinsic worth of sound has rescued her from that certain fate of modernists or would-be non-classicists. Her ideas suggest that the exact opposite of that is true. Everything is music and music is everything for Satoko Fujii. And with these two vastly different CD, you room will be filled with it. 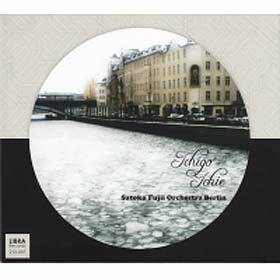 Ms. Fujii’s performances on— Ichigo Ichie a work for her Berlin large ensemble features an intense meeting of minds. The longer work emerges as an explosive and heartfelt series and emotional scenes. Each inhabits its own expressive world, yet the musicians maintain a through-line that connects the journeys of the various expeditious journeys. As beloved and familiar as this large format work may be it would be difficult to imagine interpretations that make a better case for the vibrancy of the composer’s achievements. Ms. Fujii leads a brilliantly rehearsed orchestra into music that is edges with a silver glow and penetrating urgency to every line in close alliance with her own aristocratic fervour and thoughtful pianism. I would be remiss if I did not also say a word or two about the Orchestra Berlin: they come off as players who epitomise cohesion and intimacy. Track List: Ichigo Ichie 1; Ichigo Ichie 2; Ichigo Ichie 3; Ichigo Ichie 4; ABCD. Personnel: Matthias Schubert: tenor saxophone; Gebhard Ullmann: tenor saxophone; Paulina Owczarek: baritone saxophone; Natsuki Tamura: trumpet; Richard Koch: trumpet; Nikolaus Neuser: trumpet; Matthias Müller: trombone; Kazuhisa Uchihashi: guitar; Satoko Fujii: piano; Jan Roder: bass; Michael Griener: drums; Peter Orins: drums. 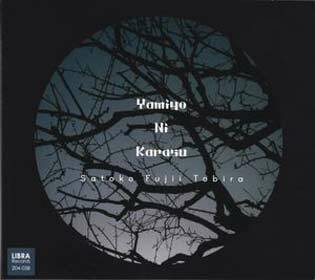 The music of Yamiyo Ni Karasu, for Tobira, a quartet is naturally more intimate and if anything, less of a narrative feature as the episodes are not connected to one another by a through-story-line. Here, the master pianist and composer’s interest in chance procedures is stepped up a gear. “Hanabi” for instance, is probably loosely notated leaving Natsuki Tamura, Todd Nicholson and Takashi Itani more room to improvise. It is almost as if the players can start anywhere, which might as well be true but—most radically—the spacing of the notes on the stave is a trusty guide about where to place the sounds in time. Kiss adios to the narrative tension and release of directional harmony, shepherded by interpretive goals of the conductor (well sort of) and play yourself, seems to be the instruction. Not without masterful cohesion, I might add. And for all the soul-gazing provoked by the sounds of silence, the pieces are simplicity themselves. Track List: Hanabi; Run After A Shadow; Fuki; Wind Dance; Centrifugal Force; Potential Energy; Yamiyo Ni Karasu.